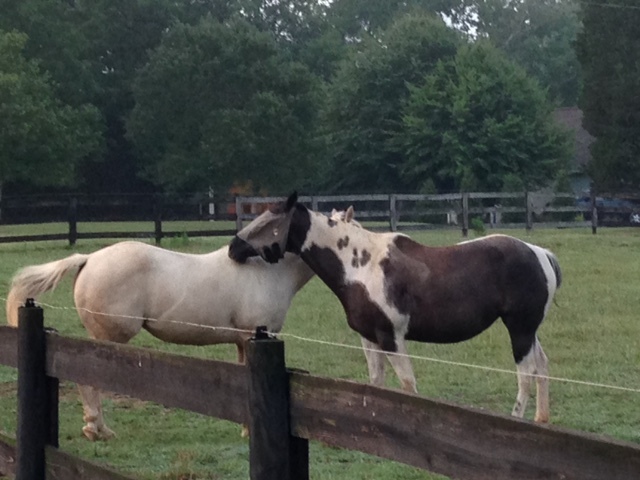 Over the past week or so Smokey has made lots of new friends. He will be going home soon, so Sydney and I invited some families from our church to come over and visit him. 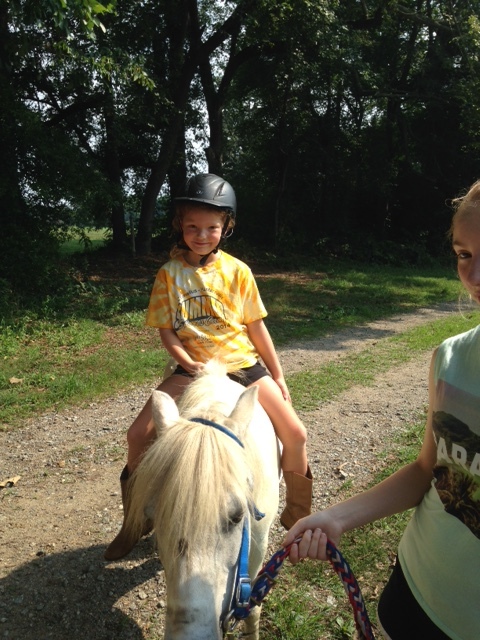 The kids brushed Smokey, and Sydney gave the children pony rides on him. And I got to visit with the moms. It’s been a sweet time! 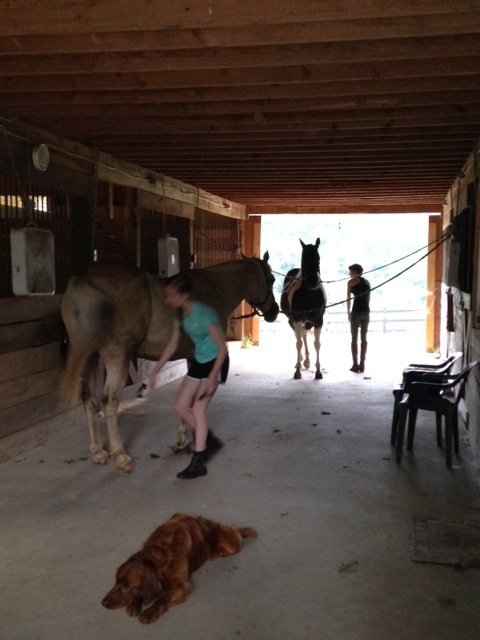 Misty and Foxie enjoyed the show from their stalls. 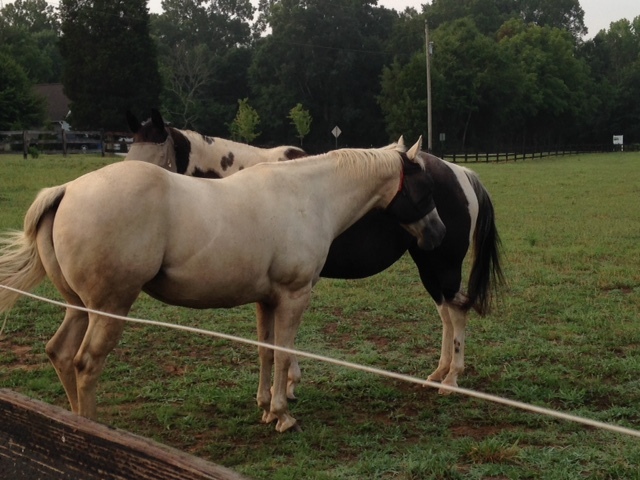 This morning, on my walk, I saw this sight…two horses head to tail. I love seeing Foxie and Misty standing like this because I know they’re helping each other — scratching each other’s backs, swishing flies off of each other’s faces, generally making each other more comfortable. Isn’t that what good friends do for each other? A little more to the right…a little higher….Ahhh…that’s the spot. Thank you, friend. I love our barn. It was built by John Black, our neighbor who sold us our land and who used to run a dairy farm. 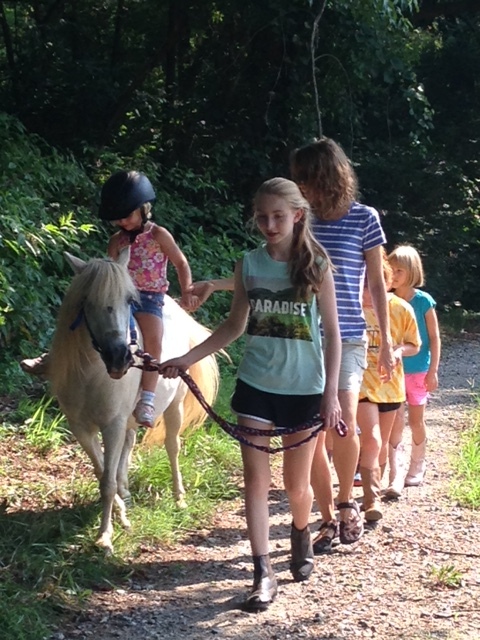 Our barn is sturdy, built with strong wood and care. Most of the wood came from June Washam’s old sawmill. June, who has a road named after him, and was recovering from open heart surgery when we knew him, came over and helped John in the building process, even though he wasn’t able to stand up straight. 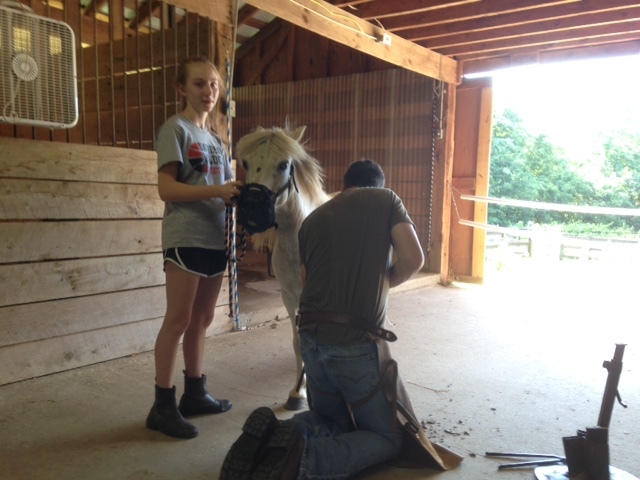 He has since passed away, but the quality of his wood and our barn still stands. John Black says, “Everywhere there should have been four nails, I put five.” Craftsmanship like that is a rare gift. And I am so thankful. 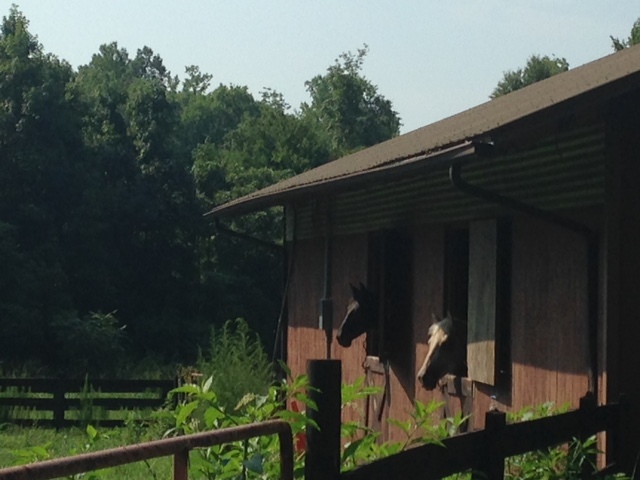 But ever since our tack room was built, I’ve wanted to paint the outside wall of it. It’s made of pressed particle board and has the brand stamped in black running in a diagonal line across it. I’ve always been someone who likes the idea of transforming ugliness into beauty…so, using some old paint that I had around the house and the barn, I began the process. I enjoy painting, but I don’t consider myself a real artist. My brother Bill was the artist in our family. His watercolor scenes and portraits mesmerized and amazed me. He could perform magic with his brush. My attempts at drawing nature and wildlife were enthusiastic, but typically the trees and the animals were somewhat ill-formed and oddly shaped. But there was something exciting about the process. These days I enjoy the idea of transforming a plain wall into something magical. Not that I have any misconceptions about my talent. I know it’s raw. Maybe more than raw. But there is joy in the process … the idea of creating something new. So I went to work on the outside wall of the tack room. I started by painting over the particle board with a tan color. It was a hot day, close to 100, and I had to stand on a stool, then a chair to reach the top of the board. Covering the particle board in paint proved harder than I had imagined. After about an hour, I had less than a quarter of the wall painted and I was drenched in sweat. A wasp crawled out of the wall and circled around me. I held my breath and it flew away. I stepped back every 10 minutes or so and surveyed my progress, promising myself I would stop … after I was one-third of the way done, then halfway, and finally, gradually, I only had the top left corner to finish … so I persevered. Then the wind kicked up and the temperature dropped from 98 degrees to the mid 80s and it felt positively cool. I went up to the house as the first rain that we’d had in weeks began falling. But after a few minutes, I thought to myself…Why am I here when it’s finally cool? So I scrounged around the house for some blue craft paint that I could add to the partial can of white paint in the barn. I found some and returned to the barn to paint the sky. It was a pleasure to paint as the wind stirred through the barn. 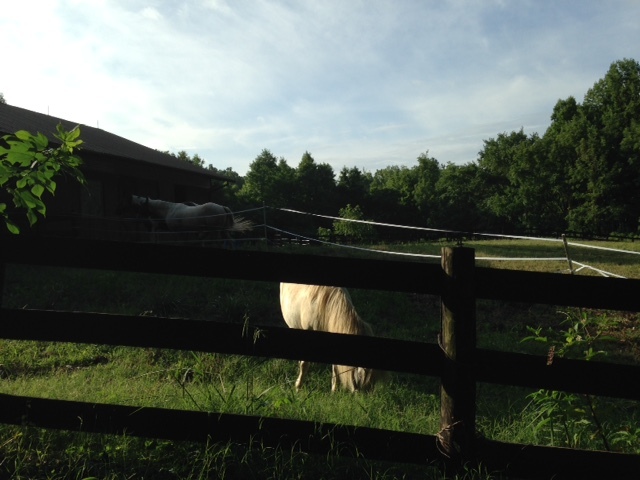 I could hear the horses rustling behind the barn and the occasional stomping of hooves. The coat of blue went onto the particle board a bit easier. 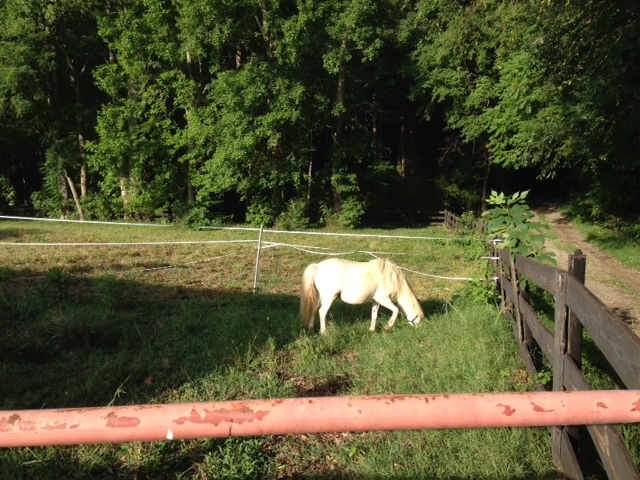 A few days later, when I had a few hours to myself, I began painting the green that would be the pasture. It took me a while to turn the pale blue paint into green. I don’t like to waste anything, so I stirred yellow into what remained of the pale blue paint. 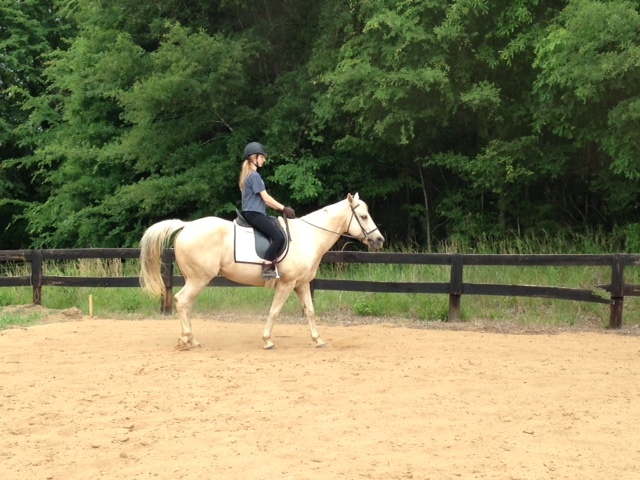 When I tried it out, I could tell that the sky and the pasture would be almost the same color. It took a lot more yellow and some dark green craft paint to finally come up with something dark enough to pass for a pasture. 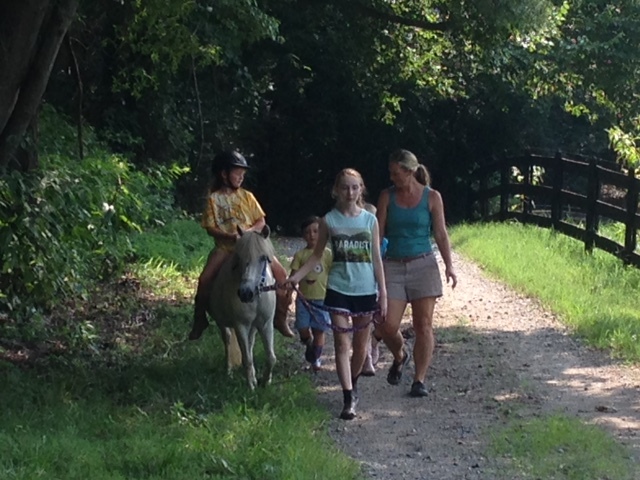 I was most excited about adding horses to the scene. 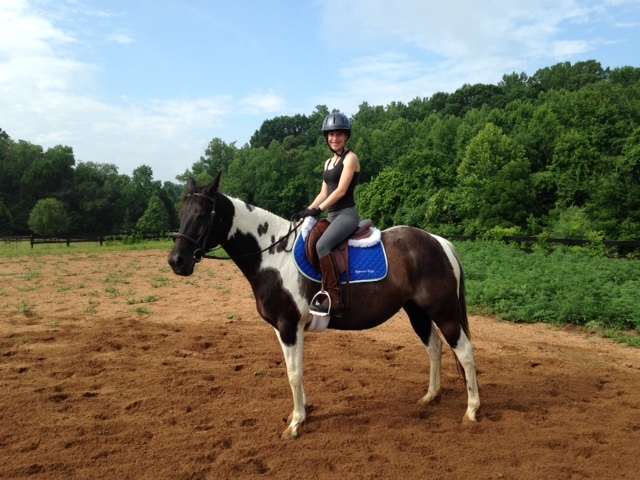 My plan was to paint each of the horses that are currently on the farm…and possibly add Crimson (looking down from a cloud). 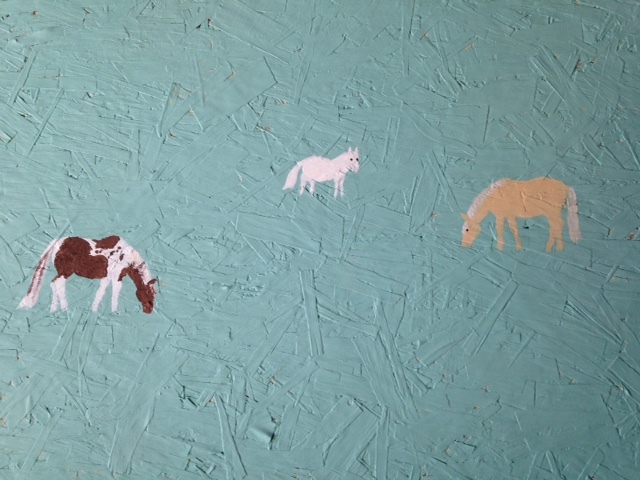 I painted Foxie (a palomino), Smokey (a grey Shetland pony) and Misty (a paint) using silhouettes of horses I found on the internet as a guide. It was fun to add their distinctive coloring. I still need to add some shadowing on Smokey as he looks a bit ghost-like. After painting the horses, I added some fluffy clouds and then… as is often the case… my time was up. I still hope to add Crimson and some trees and a Bible verse that I discovered as I was contemplating the dream of having horses back on the farm. 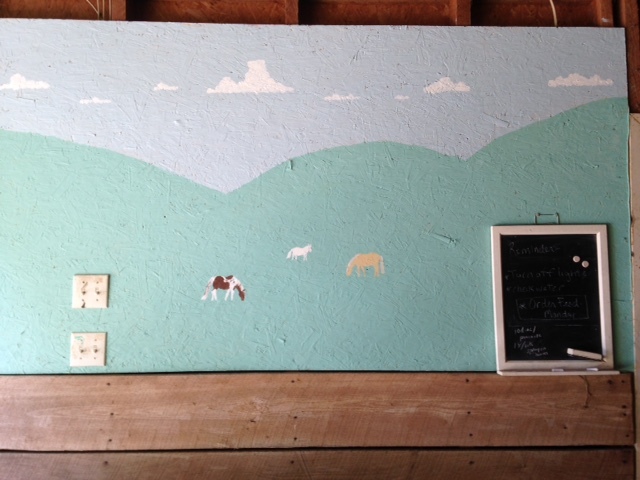 The mural on the tack room is still evolving. It’s a long way from perfect. But then so am I.
Smokey has always had the ability to go where he wants to go. 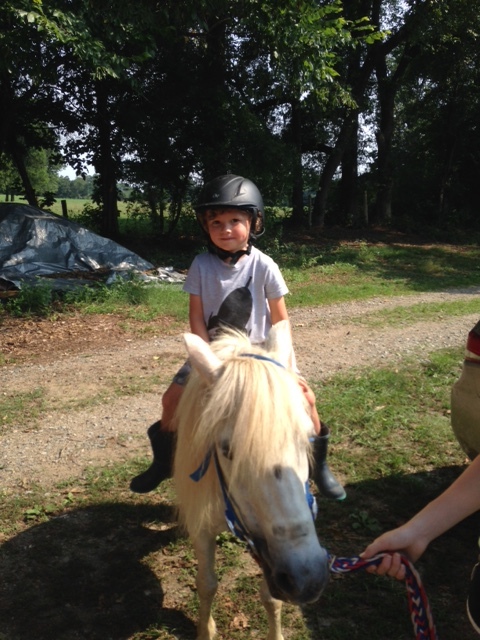 He’s a smart little fellow and can slip through gates and under fences with ease. Last week, when I “roped off” a small area of the shady paddock, I knew it wouldn’t be long before he found his way under or through the temporary fence. He didn’t disappoint! After a few days, I decided to take down the third and lowest strand of fence tape, since it seemed — no matter how often I tightened it — to always be sagging in the morning. 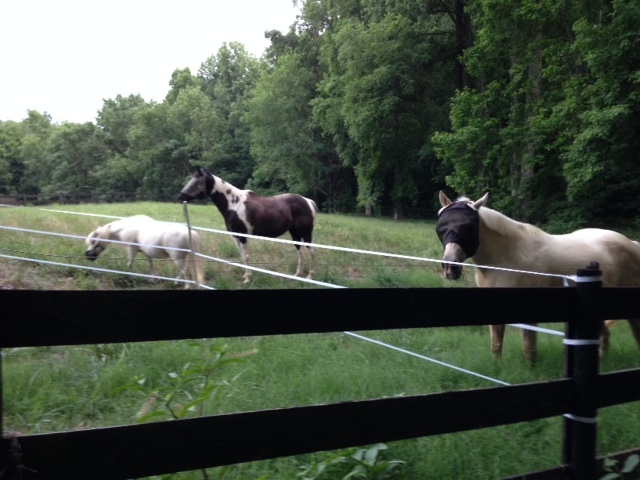 The other day, all three horses found their way into the tiny corner of the paddock that had been “sealed off.” Wish I’d taken a photo of that. 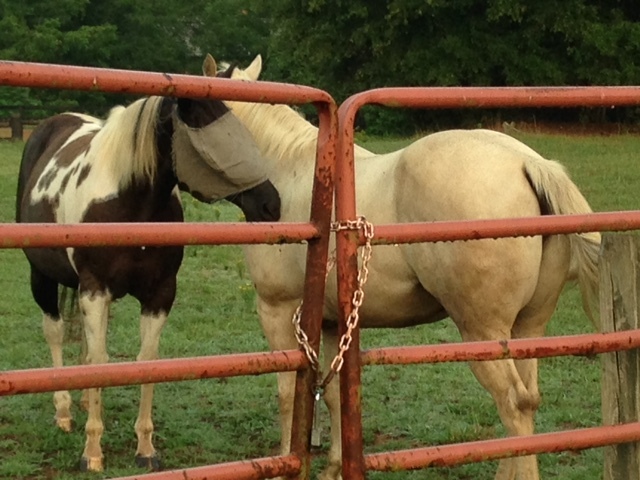 So, after refilling the big hole I had been trying to “rope off,” I decided to take the temporary fence down since the only thing it seemed to be doing was piquing the curiosity of the horses and encouraging them to explore. 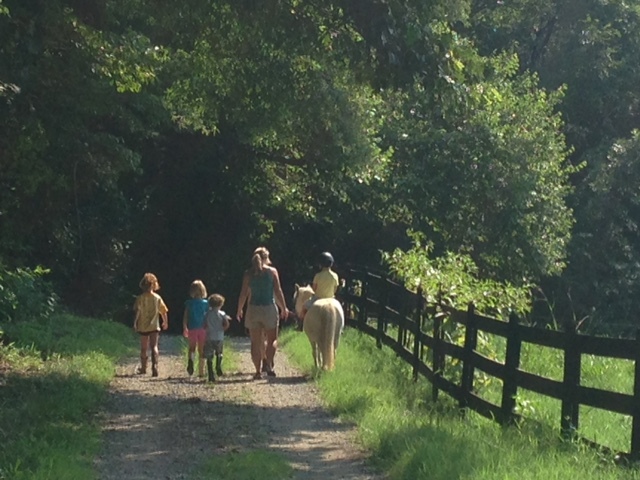 The girls walk up to the big pasture and bring the horses in for breakfast. 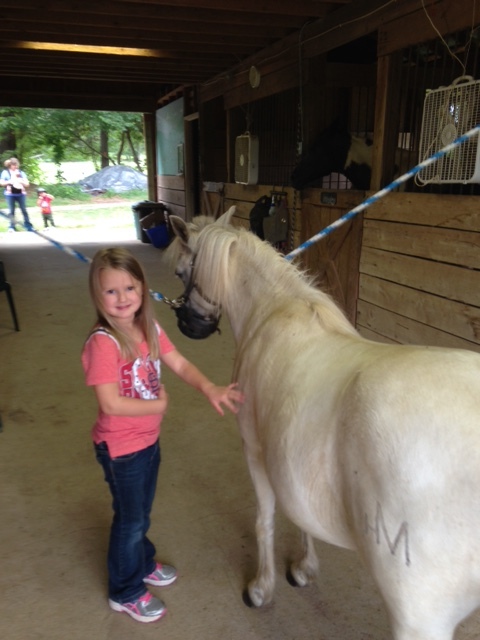 Sydney brings Foxie, the lead mare. 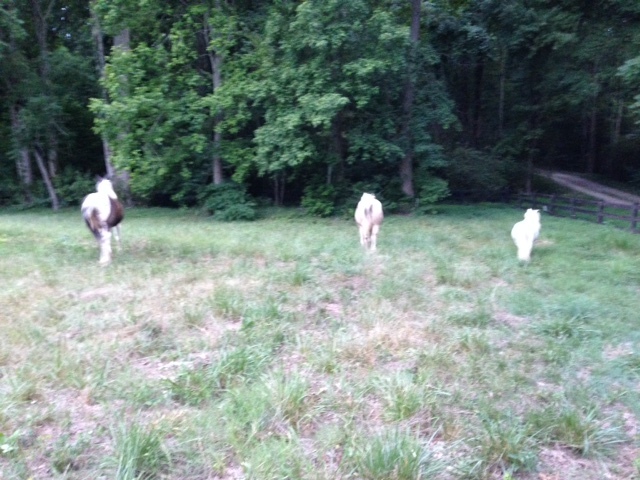 Misty and LK follow and Smokey brings up the rear. 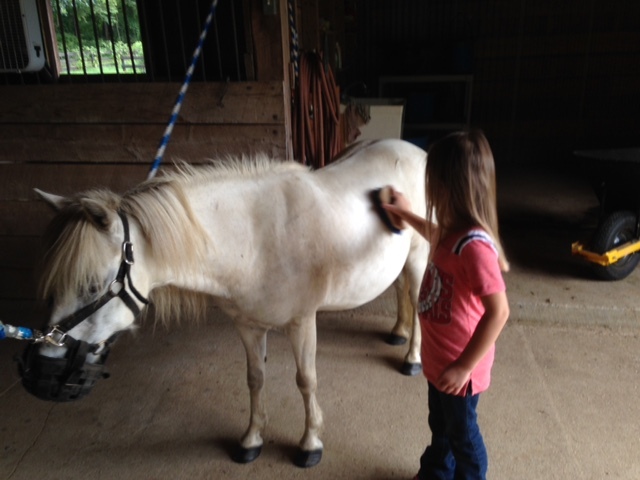 The girls groom the mares in preparation for their ride. Sunny sprawls on the cool cement floor. 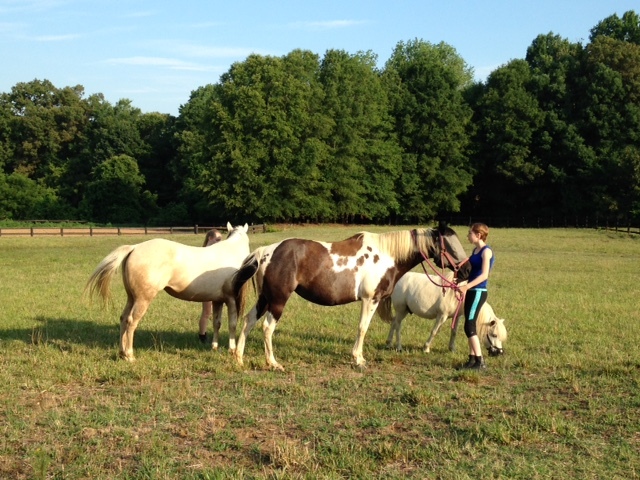 At the beginning of the week, I let the horses into a new paddock. I’d been “saving” it for the summer because it’s nice and shady. I would have let them into it sooner, but there was a area that tends to get holes in it that I needed to rope off. Last weekend, I finally got the temporary fence posts deep in the hard ground, thanks to Joel, and strung the temporary fence tape. 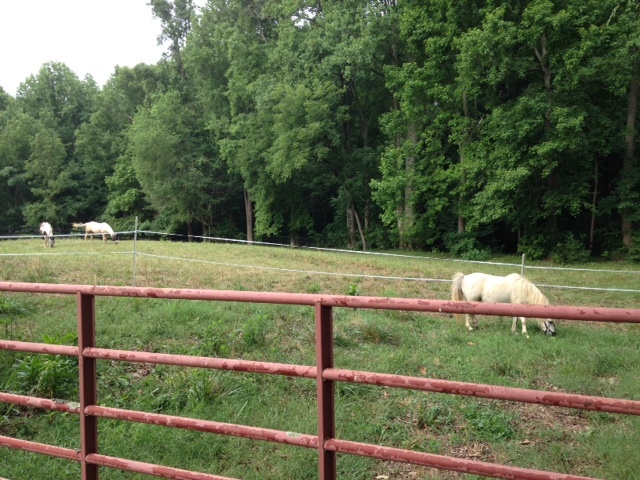 After weeks of drought conditions, the horses were thrilled with the “new” paddock and all the moist green grass. They took off to explore. 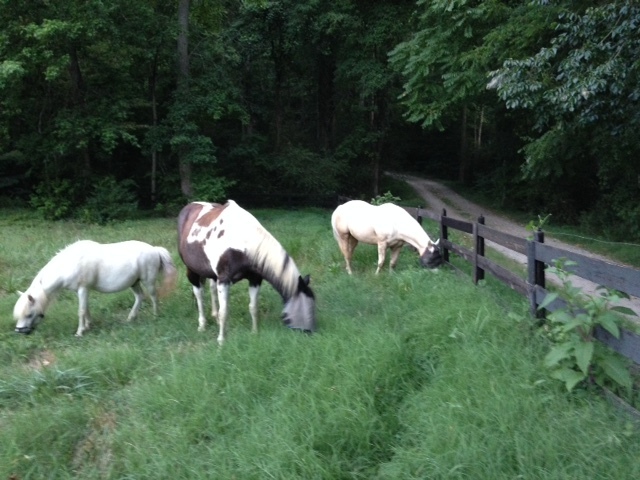 The horses were a little curious about the area that was fenced off. 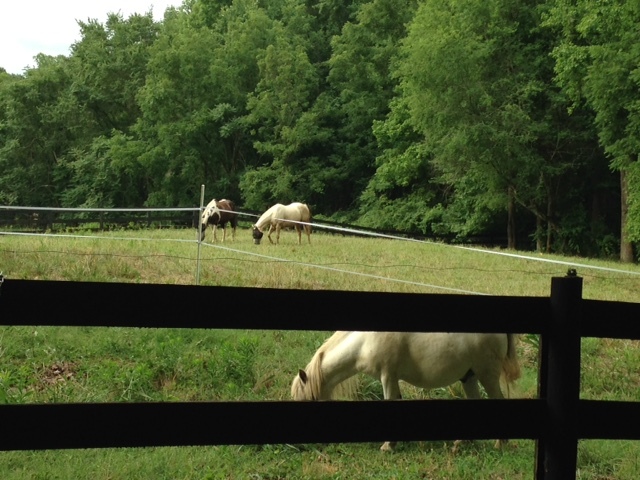 It must be that thing about the grass always being greener…. But they quickly settled down and enjoyed the luscious green grass. 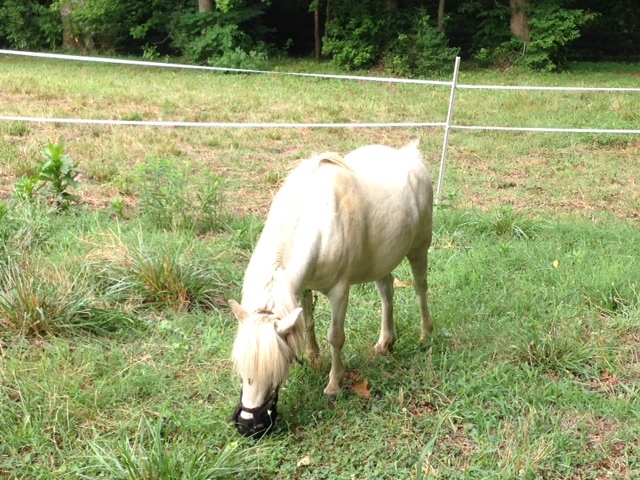 It was a sweet sight seeing them grazing contentedly together, muzzles buried in the grass. 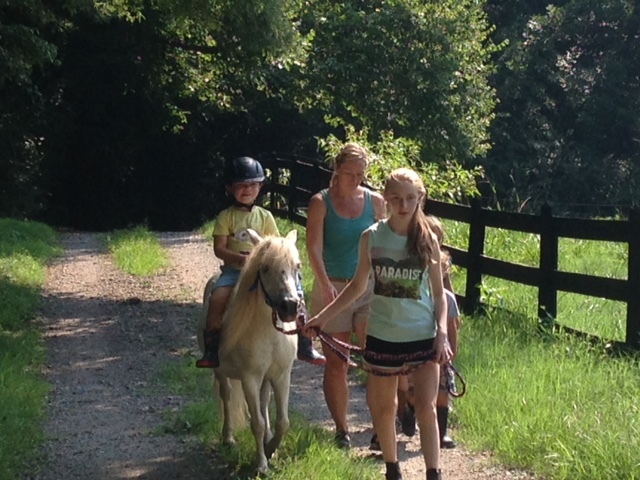 We are blessed to have several paddocks and such wonderful grass!